"God made me a Father and Mother more worthy of Heaven than of Earth." 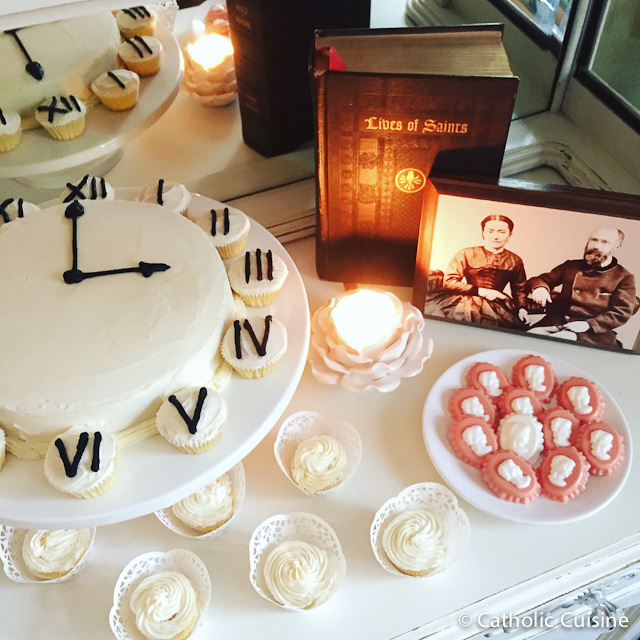 I spent yesterday afternoon creating a few treats to celebrate today's canonization of Louis and Zélie Martin, the parents of St. Thérèse. 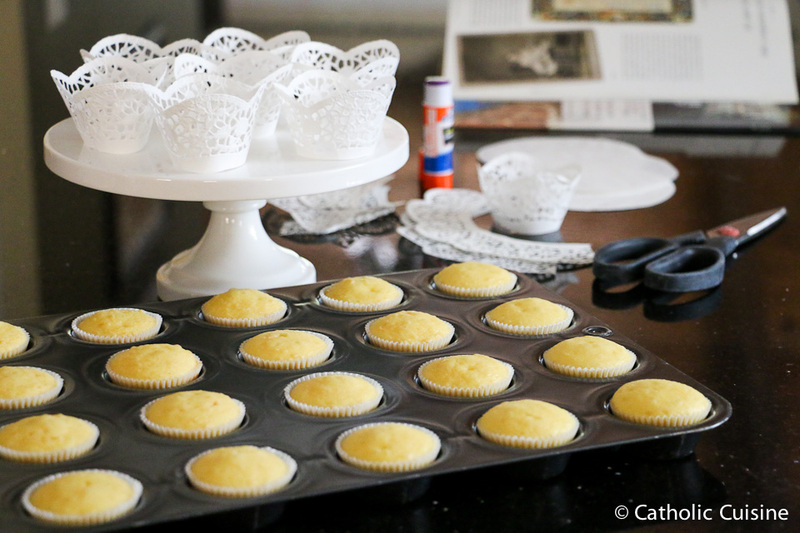 I didn't really have a plan when I pulled out a box of French Vanilla cake mix from the cupboard, but was so happy with how it all came together! I started by making "lace" mini cupcake wrappers using some 8" Doilies I had with my craft supplies. These were so easy to make and really turned out beautifully! 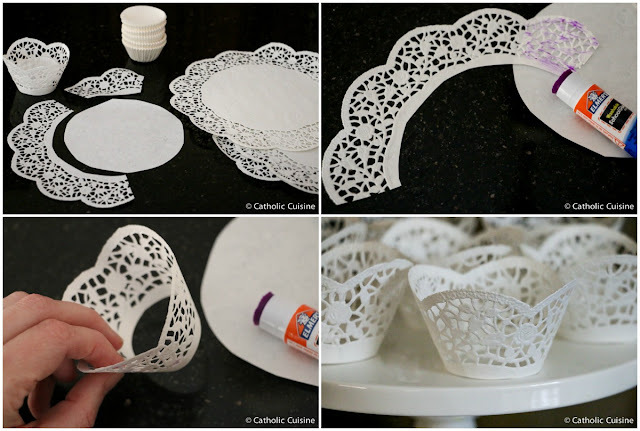 If you have larger doilies you could make larger wrappers for full size cupcakes. 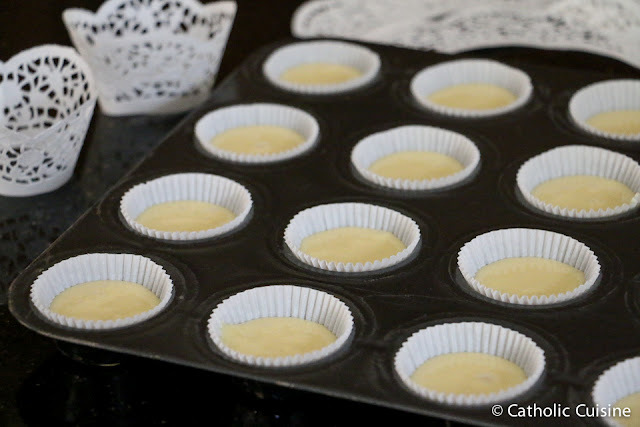 While I was assembling the cupcake wrappers, I baked 24 mini French Vanilla cupcakes, saving the remaining batter for a small 8" round cake. 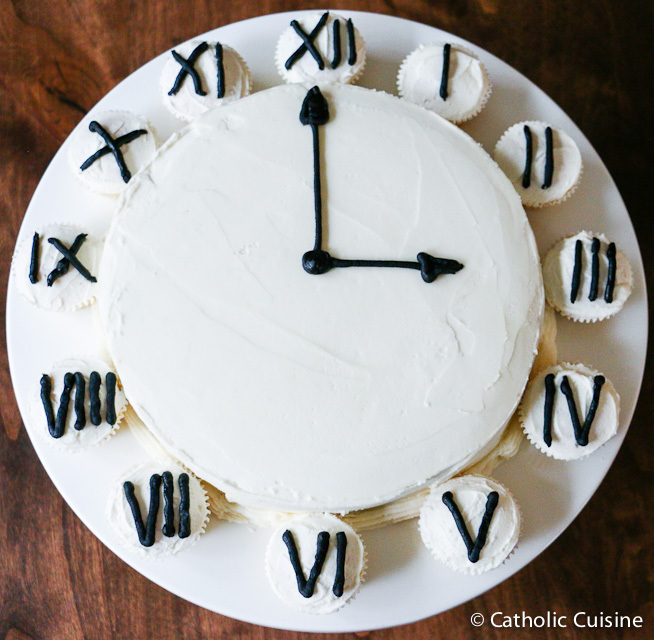 At first I thought I would decorate the 8" cake as a clock face, but after placing the cake on the platter I decided to surround it with twelve of the mini cupcakes. 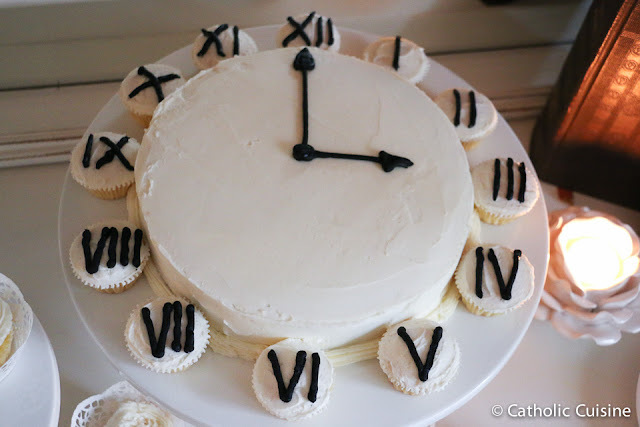 I added Roman Numerals and clock hands using Black Decorating Icing. I probably would have opted for melted chocolate if I had any dark chocolate candy melts in my stash. I also made some Saint Zélie Martin Cameo in Lace Candy. 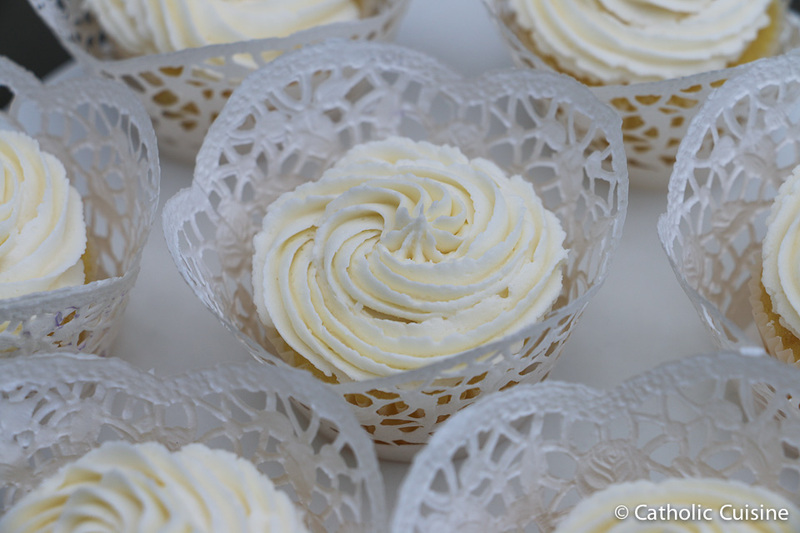 These little candies would work great as cupcake toppers! 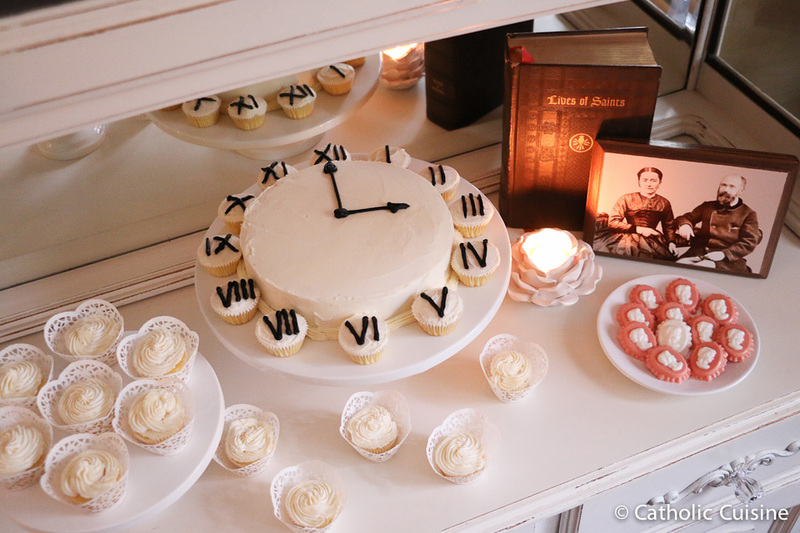 You can find additional ideas for Commemorating the Canonization of the Parents of Saint Thérèse, Saints Louis and Zélie Martin over at Shower of Roses! Saints Louis & Zélie Martin, ora pro nobis! I love how its always 3:00 on the cake. Divine Mercy. What a beautiful arrangement. I would love to know how the cameos were made. I have a cameo candy mold and I can't seem to get a defined face. I painted the faces with white candy melts and it wasn't think enough to make the image clear. I posted more details on the cameos here. I made sure to fill each face with candy to make it thick enough to look white, without having any of the pink show through. I used a toothpick to spread the melted candy to the edges and remove any air bubbles. Awesome! What a clever girl you are! I made a French beef dish for dinner and intended to take a photo. Alas, dinner was late because the roasted vegetables took too long to cook and I had to rush to serve. No photo. These are beautiful! Very clever too.